LWV-Needham is one of the 40+ local Leagues in Massachusetts. 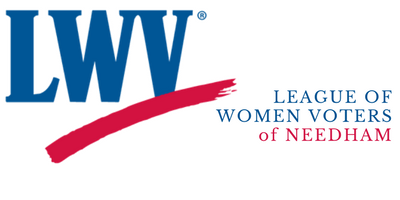 LWV-Needham participates in LWVMA program planning, studies, statewide election activities, and membership programs. Several LWV-Needham members serve on LWVMA committees. LWV-Needham members also attend statewide leadership and membership events. Visit the LWVMA website for information about LWVMA and other local Leagues in Massachusetts. The LWVUS is present in every state and the District of Columbia. LWV-Needham members participate in national program planning, studies, and membership programs. Several LWV-Needham members have attended national conventions, held every two years (even-numbered years). Visit the LWVUS website for information on the national League.